The utilization of small interfering RNAs (siRNAs) represents a new paradigm in gene knockout technology. siRNAs can be used to knockdown the expression of a particular gene by targeting the mRNA in a post-transcriptional manner. While there are a plethora of reports applying siRNA-mediated post-transcriptional silencing (PTGS) therapeutically there are apparent limitations such as the duration of the effect and a saturation of the RNA-induced silencing complex (RISC). Recently, data have emerged that indicate an alternative pathway is operative in human cells where siRNAs have been shown, similar to plants, Drosophila, C. elegans, and S. Pombe, to mediate transcriptional gene silencing (TGS). TGS is operative by the antisense strand of the siRNA targeting chromatin remodeling complexes to the specific promoter region(s). This siRNA targeting results in epigenetic modifications that lead to a rewriting of the local histone code, silent state chromatin marks, and ultimately heterochromatization of the targeted gene. 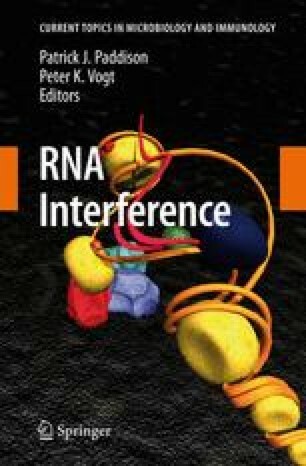 The observation that siRNA-directed TGS is operative via epigenetic modifications suggests that similar to plants, and S. Pombe, human genes may also be able to be silenced more permanently or for longer periods following a single treatment and may in fact offer a new therapeutic avenue that could prove robust and of immeasurable therapeutic value in the directed control of target gene expression.